KMS Bearings manufactures radial ball bearings utilizing type 316 stainless which provides superior corrosion resistance when compared to conventional 440 stainless bearings. Type 316 stainless is widely used in the food, medical, marine industries. Bearings produced from this type of steel can run in liquids or can run dry at slow speeds. Machined semi-precision rings, polymer cages, and grade 100 type 316 stainless balls are used in the manufacture of KMS Stainless Ball Bearings. This type of bearing is intended primarily to reduce friction and permit free movement of turning parts. They are best suited for moderate loads and slow speeds. RINGS: AISI 316 stainless, non-magnetic, unground semi-precision. BALL RETAINER (CAGE): Standard ball retainers are Polypropylene or Acetal. When higher heat capability is required, bearings can be manufactured with either a high temperature polymer cage or without a cage. SHIELDS/SEALS: Open design is standard. Polymer shields and seals can be provided on a special order basis. LUBRICATION: KMS supplies the bearings with a light proprietary oil that reduces friction and noise, and is non contaminating in most applications. When necessary, special order lubricants can be provided. SUPERIOR CORROSION RESISTANCE: Most bearing failures today are caused by corrosion. 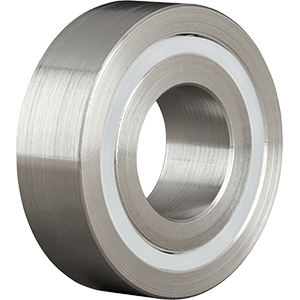 KMS 316 stainless bearings can be utilized in environments destructive to conventional bearings. CAN BE WASHED DOWN: They can be washed down without having to re-lube to prevent rust. RUN IN LIQUIDS: Sea water, detergents, solvents, gasoline and hostile chemicals are no problem! 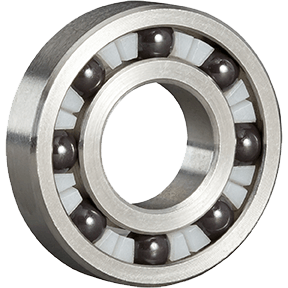 CAN RUN DRY IN SLOWER SPEEDS: 316 Stainless bearings do not require oil or grease for corrosion protection. NON MAGNETIC STAINLESS: Austenitic stainless steels, like 316 stainless, are not considered to be magnetic materials. HYGIENIC: 316 Stainless bearings can be washed down, will not rust, require no lubrication and can be sterilized. HIGH HEAT CAPABILITY: A KMS 316 Stainless bearing, fitted with a high temperature polymer cage or without a cage in a full complement construction, can run at higher temperatures up to 1000°F.